There are many ways to finish a woodworking project. Much of the decision depends on the look you’re going for. 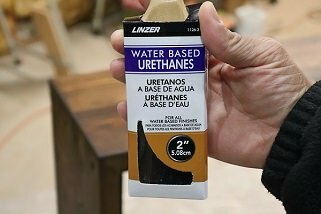 For the purposes of this project I’ll be using an oil based stain and covering the preparation and finishing process I take on a project. Keep in mind that the materials used can vary greatly depending on the nature of the project you are working on but I hope some tips can be picked up from the following. Preparing the surface by sanding is the first step. The lower the grit of a sandpaper the coarser the grain and the more material it will remove. I’m beginning with 80 grit because I want to even out the surfaces of the table a bit. 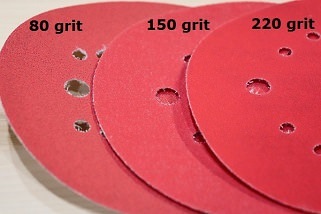 The coarser grit will help remove material faster than the finer higher grits. 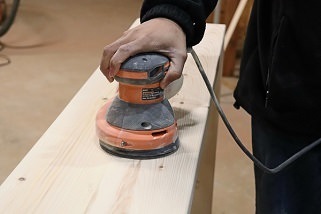 Clean any loose dust from the table with the shop vacuum before moving on. 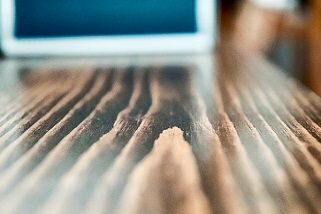 Moving up through the grits of sandpaper will smooth out the work surface more and more with each successive grit. I regularly go up to 220 grit as the final grit. This leaves the surface smooth with just a little bit of the wood texture left to the touch. 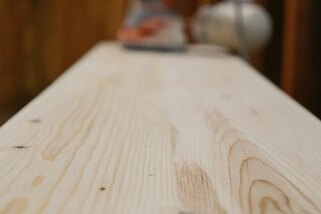 Make sure to sand all surfaces, never letting the sander sit in one place for too long. I try to keep movement in well-paced consistent strokes, always going with the grain of the wood. Clean away all the dust between each sanding. 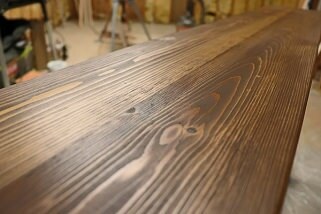 With the surface sanded, you would think applying stain would be the next step. 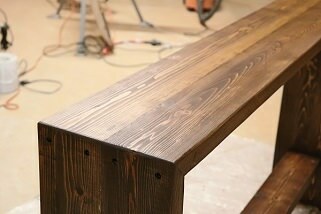 While you can proceed right into staining, softer woods like the pine used here could use a little help before staining. 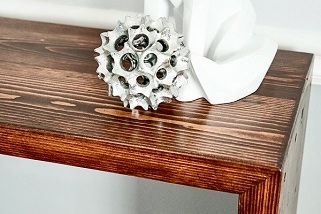 Because the wood is soft, it can absorb stain at random rates in different areas, which can result in a blotchy finish. This is where the pre-stain conditioner comes in. 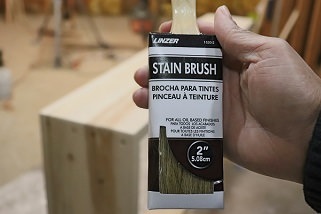 Pre-stain evens out the absorption rate across the wood surface creating an even application substrate for the stain. 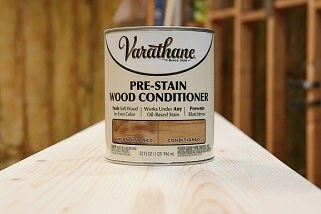 Stir the pre-stain conditioner well and then apply the conditioner to the project. 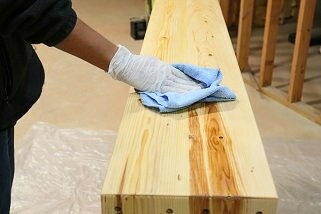 Brush the conditioner across the wood grain generously and wipe away the excess conditioner going with the grain. Make sure to cover the entire piece and allow the conditioner to penetrate for a minimum of 30 minutes. 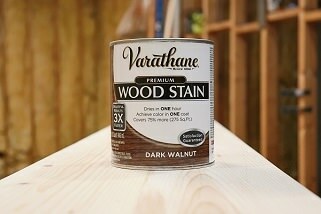 Once that time has elapsed you can begin to stain right away if you wish. Stir the stain (don’t shake) and apply to the work going with the grain. Keep a bundle of lint free rags on hand as you will need them throughout the process. I tend to break the project up into manageable sections. 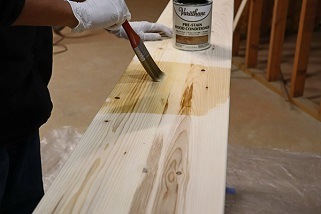 In this case, I start with the interior surfaces applying the stain fully before wiping away the excess. I then continue around to the “show” surfaces and take my time with them still breaking things up in manageable sections. Allow the stain to completely dry. At this point there are a couple of options. 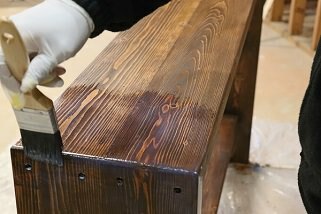 You can apply another coat of stain if you want a richer color, or if everything is to your liking, it’s time to move on to applying the protective finish. 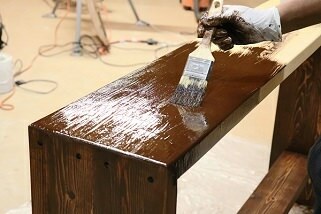 A good top coat can be the difference between an ok project and a great one. It is also a great way to protect the piece from things like water damage, stains and minor dents or scratches. This console table is going to be in my living room and get a lot of use for things like tossed keys, phones and potentially the occasional drinking glass. The triple thick polyurethane offers a thick protective coat in a minimal number of applications. I chose water based polyurethane for the clarity it dries to. The oil based polyurethane can leave a slightly golden tone which I didn’t prefer in this particular case. Try to position the piece in a level area before starting this step. This particular polyurethane is self-leveling. 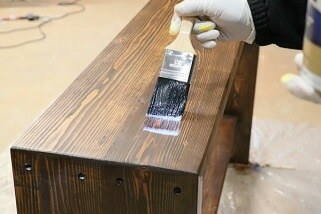 Apply the polyurethane with a synthetic brush in even strokes. 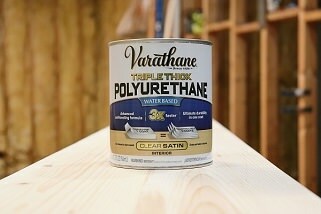 Blend brushed edges while the polyurethane is still wet. 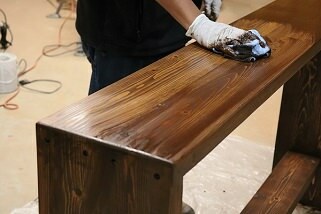 This particular top coat goes on thick so you will need to work in manageable sections. Make sure to move around the piece looking for and stopping any drips by working them lightly with the brush. I like to give the polyurethane a few days to dry and cure before putting the piece into use. 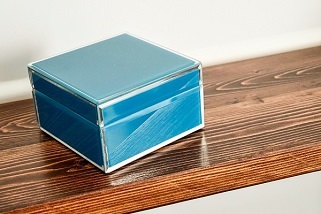 I tend to lean towards satin finishes as I love the subtle reflection and thin glass topped look the finish gives. 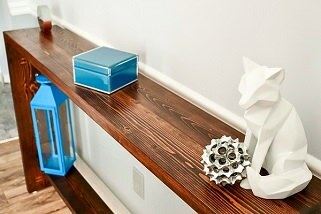 Over time and depending on the project you’ll find the finishes you prefer for a given project. So that’s my process. I’ve included some of the final images below. The steps I used in this are pretty common. 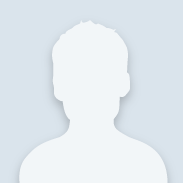 You will find that everyone has their own slight variations or product preferences. That’s absolutely ok. In the end don’t be afraid to experiment with different finishes and techniques. You’ll be surprised at how many awesome variations you can achieve. I hope this helps. I love simple projects that can make such a big impact.. Thank you for sharing your techniques and your project with all of us. I love it. i look its good, and the materials very strong..